Posted by Canby Public Library in Community News. Loosely Bound is a group of 14 fiber artists who have been working together since 2005. Members chose the name Loosely Bound to reflect the ties they have to each other and the traditions they come from, but at the same time, the respect they have for their differences in design, interests, technique, and palette. Loosely Bound members have created a group piece specifically for the Canby Library exhibit "The Garden Spot" which takes its name from the city motto. 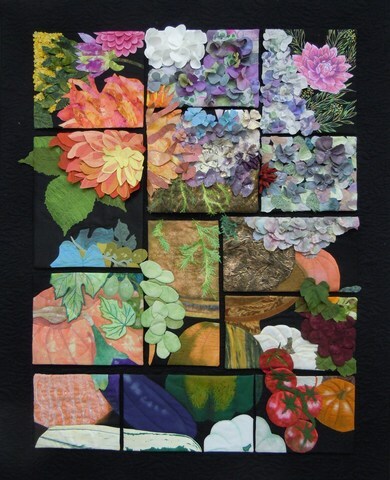 The piece, "Abundance", is a tiled portrait made up of 13 small panels, each made by one of the members. It celebrates the abundance of fruit, flowers, and vegetables found in the Willamette Valley. A total of 25 art quilts with an agricultural theme are on display through August 25.